White terrorism is very prevalent but often overlooked in the media. 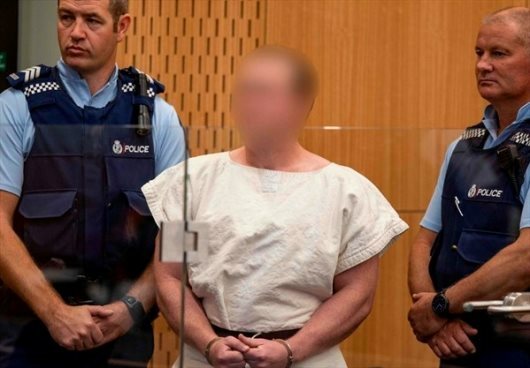 AFRICANGLOBE – In addition to his graffiti-adorned AK-47s and bullet-bearing backpacks, one of the weapons confiscated in Christchurch from Brenton Harrison Tarrant was a 74-page manifesto titled “The Great Replacement.” This white supremacist screed is, according to those who have read it, the same mélange of toxic mythology that’s animated other accomplished or would-be mass murderers in recent years. “You will not replace us,” was the chant of the white supremacists in Charlottesville, one of whom ran over and killed a counter-protestor. Roars and whimpers and unfounded fears about white genocide is infused in the writings of Dylann Roof, who massacred Black worshippers in a Charleston, South Carolina church. They permeated those of the white nationalist Coast Guard lieutenant from Maryland, who was recently arrested before he was able to carry out his plans to kill journalists and politicians. These men reverently referred to similar paranoid fantasies by David Lane, the American white supremacist convicted of killing a Jewish radio host. Lane, in turn, extolled the writings of William Pierce, another American white supremacist, who wrote a book invoked by Timothy McVeigh, the Oklahoma City bomber who murdered 168 people, and Anders Breivik, the Norwegian terrorist who killed 77 people, most of them teenagers. Europeans today are a mix of the blending of at least three ancient populations of hunter-gatherers and farmers who moved into Europe in separate migrations over the past 8,000 years. … The modern humans who came out of Africa to originally settle Europe about 40,000 years are presumed to have had dark skin … And the new data confirm that about 8,500 years ago, early hunter-gatherers in Spain, Luxembourg and Hungary also had darker skin. As medieval history scholar Paul B. Sturtevant notes, “The idea that [medieval societies] are this paragon of unblemished whiteness is just ridiculous … It would be hilarious if it weren’t so awful.” What makes it so awful is not just that this mythology “informs” the perpetrators of racist violence, but that it fuels the simmering grievances of ordinary white people who would genuinely condemn these extreme actions, while adhering to essentially the same ideology. This belief that the Americas and Western Europe have always been white, is wrong. From the moment that white Europeans invaded North America, they ensured that ours would not be a homogeneous culture. The food we eat, the music we listen to, the slang we sling — all of the artifacts of our daily lives, everything that lends those lives color and intrigue and challenge — are a product of diversity. To those who fear being “replaced,” my sincere question is: What does that mean to you? Beyond potentially outnumbering you in the future, what does it mean for immigrants or nonwhite people to replace you? In the days leading up to the 2008 election, I recall listening to a NPR story that relied on focus groups and individual interviews with representative groups of voters. One participant explained her fear of an Obama victory. She recounted how, as a white child in the Deep South, if she was walking down the sidewalk and a Black person approached, she learned to expect that the Black person would step aside — into the street if necessary — to ensure that she had a clear path. If the U.S. had an African-American president, she worried, would the roles become reversed? Would she now have to be the one stepping aside? Is that the “replacement” that these defenders of Western civilization fear? Because another scenario beckons, one in which we share the sidewalk, make space for each other to pass. That’s the civilized thing to do.